It is difficult for anyone to accuse a medical provider of malpractice. We all want to believe the healthcare community does not commit negligence, but most of our medical malpractice clients come to us because something went wrong in a medical setting that should not have gone wrong, and they have suffered a serious injury. 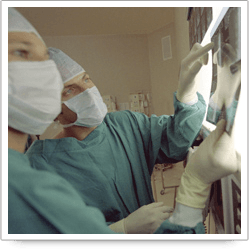 At Riley & Jackson, P.C., we handle medical malpractice cases involving physicians, nurses, hospital, paramedics, and other actors in the healthcare community when the evidence establishes that malpractice occurred. We offer a free initial consultation to determine if you have a valid case. In Alabama, medical malpractice cases are governed by the Alabama Medical Liability Act (AMLA). This law applies to cases against all types of health care providers, including physicians, physician assistants, nurses, hospitals, pharmacists, imaging technicians, respiratory therapists and a variety of other health care specialties. For more information or to schedule an initial consultation with medical malpractice attorneys, please call 205-879-5000 or send us an e-mail via this website.